Jeweled cichlids is a commonly used form of the popular name of Hemichromis bimaculatus, Jewel cichlid. They are popular and very beautiful aquarium fish and are found in Western Africa. Jeweled cichlids are relatively small and can therefore be kept in smaller aquariums than many other cichlids species. They grow to be almost 14 cm/ 5.5 inch. This cichlids species can be quite aggressive and shouldn’t be kept with small timid species. Their reputation for aggression is however exaggerated. The truth is that they are relatively friendly towards other species outside the breeding period and can be kept in with a number of other species as long as the aquarium isn’t too small. Suitable companions for jewelled cichlids include Kribs, other Hemichromis, cichlids found in South and Central America as well as Barb and Danio species. They can also be kept with cory cats and different sucker mouth catfish without any problem. The aquarium should be decorated with a sandy bottom and a number of rock caves where the fish can hide. This species also likes a few flat rocks in the aquarium. Plants are not necessary and most plants will be destroyed if you try to keep them with this species. If you want to keep plants with your Jewel cichlid fish I recommend you try a hardy species such as Amazon sword plants, Anubias, Java fern and crinum. The water values should be pH 6.5-7.5 and temperature 23-27C / 74-80F. This species should not be kept in aquariums smaller than 150 L / 40 gallon. This species is very easy to feed and accepts most food types. They can be kept on a diet consisting solely of pellets and will most likely spawn when kept on this diet but their colours will be better if they are given a more varied diet including frozen and live food. Jeweled cichlids are easy to breed once you have an established pair and will display stunning colours during their breeding period. They spawn on a flat rock where they lay up to 500 eggs which are guarded by both parents. Jeweled cichlids are usually good parents and can be trusted to care for their young provided the spawn in a breeding aquarium or an aquarium with little other fish. The fry can be feed newly hatched Brine shrimp once they consumed their yolk sacks. The parent usually guard their fry until they reach a size of about 1 cm / 0.4 inch and it is best to separate the fry and the parents at this time. Most fish found in aquarium stores are aquarium breed. There are a number of other close relatives to the Jeweled cichlid available in the aquarium trade, some of who also are called jewel cichlids. Some of these species are even more colourful then the regular jewelled cichlid and true gems to keep in any aquarium. I would personal like to recommend every one that like this species and has kept them successfully to try keeping Hemichromis lifalili which grows to be 10cm / 4 inch and is one of the most beautiful freshwater fish available. 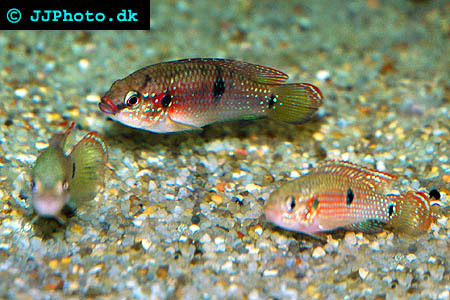 They make the jewelled cichlid seem common and dull but are a little more sensitive then the regular jewel cichlid.